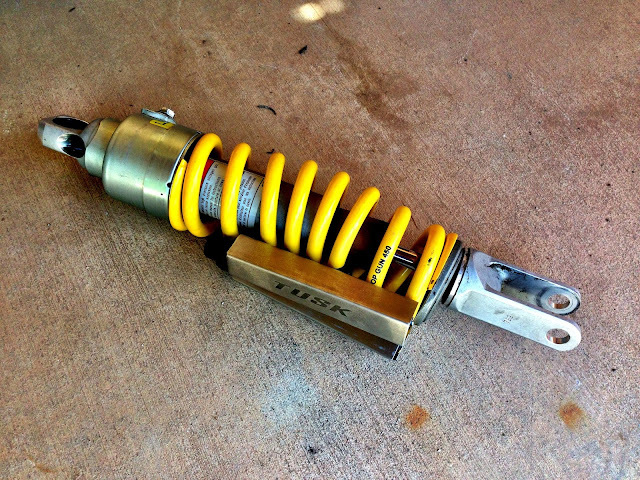 The original plan was to swap out the stock spring and go with a Top Gun 8kg spring upgrade to handle the load. That all changed when a) thinking all along that the adjustable stock spring was at its highest setting, but was in fact bottomed out with a broken pre-load adjuster, and b) when I tried to compress the Top Gun shock with a set of Tusk spring compressors for the install. This is what FUBAR looks like. I figured if the pre-load was busted at its highest setting - 5 - I could live with that being a fixed value, as long as the Top Gun spring compensated that stock spring's shortcomings. 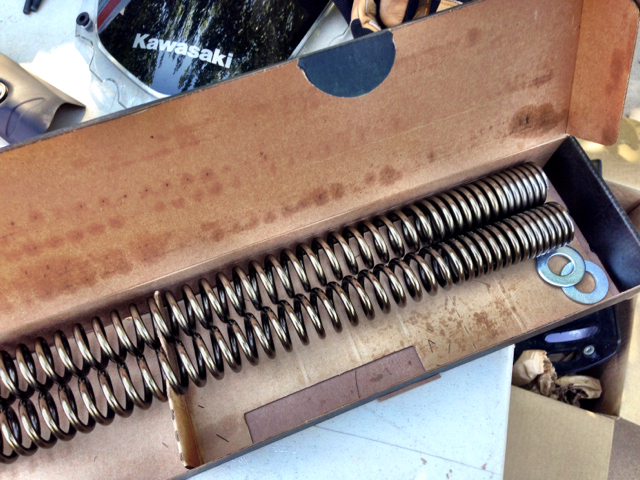 But, the Tusk compressors slipped because I didn't tape the spring where they mounted, and because there was no way in bloody hell they were going to compress that spring far enough because they weren't long enough to grab enough spring for the compression in the first place. The rear brake master cylinder is now protected with an SW-Motech guard, the stocks pegs were swapped for a pair of IMS Pro-Series foot pegs, and a new adjustable center stand from Happy Trails will make chain maintenance more of a Zen thing. There's a lift handle added to the other side. Tusk 30mm handlebar risers were added resulting in a surprising difference for me, not only for control off-road when standing but also for long rides, relieving much of the numbing I experienced with the bars in the stock position. A Wolfman bottle holster has been added to the right Pelican pannier holding an MSR fuel bottle, making oil maintenance easier and freeing up some room in the top case. These lamps added a whopping 1052 lumens to the KLR's illumination, with 10 degree spot angles and adjustable output for each fixture. They burn at 6000 kelvin, making my stock head and high beam look like they belong on an old French scooter. 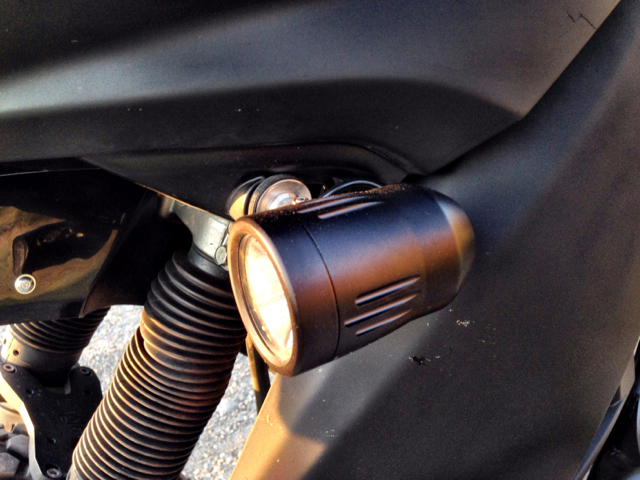 Wanting to avoid any extra holes or hardware, I eliminated the stock turn signals and replaced them with SW-Motech indicators on the hand guards, freeing up the space to mount these lamps. I wanted to maintain the break-away engineering of the stock signal posts but couldn't come up with anything that would be rigid enough to keep the housings from bouncing around, so I put together some hardware that fit perfectly into the turn signal post recess on the fairing. The hardware used includes two stainless 1" fender washers with 3/8" centers, a smaller diameter stainless washer that works as a spacer in between, and a rubber 1" washer to allow adjustment while maintaining tightness. 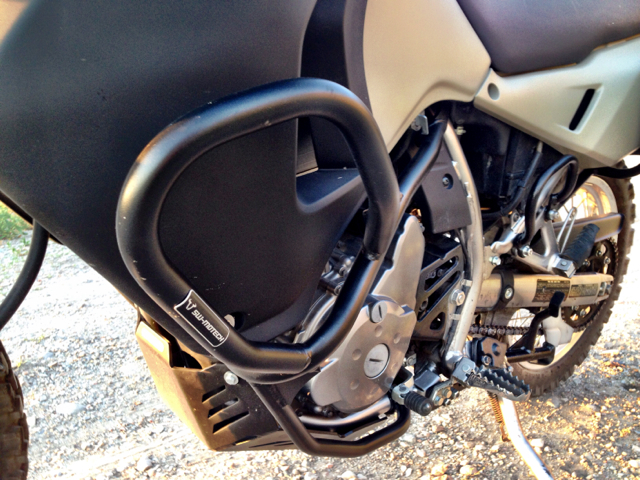 The most vulnerable bits on the KLR are the radiator and engine case. There's no factory protection for the cooling system and the plastic skid plate that ships with the bike is more cosmetic than anything armored. And while the factory hand guards do well to deflect air, there's little more protection offered since they're open at the bar ends. There are a number of aftermarket alternatives out there to remedy these issues and after considerable research I decided to go with SW-Motech products. Much was said about their fit and finish, and the installations required no last-minute alterations or engineering to get everything to match up. And they were right. 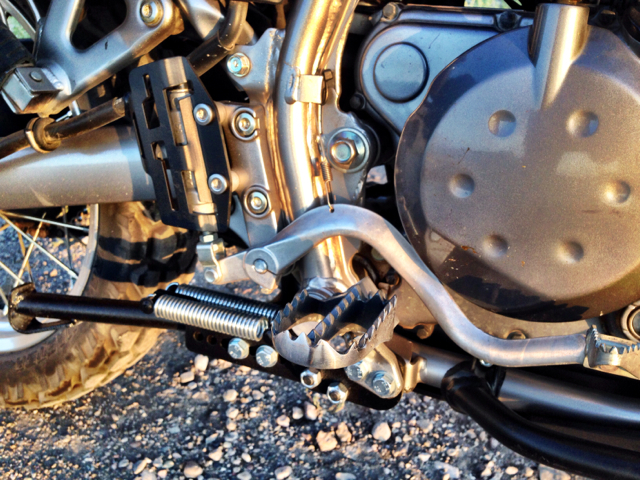 The KLR's first long ride made it painfully evident that the suspension would need some work. After researching tested alternatives I decided to go with Progressive springs on the front. The installation is straight forward, just take care to not strip the aluminum threads on the caps. I'll spare the process details - you can find ample YouTube help, some good, some questionable. Diving is minimized dramatically, sudden stops no longer induce more panic, return is solid. Great improvement. Installation of a Top Gun 8kg spring is next for the rear axle.